Imagine the celebratory shouts of the Romans when they invented lead pipes. It must had been a huge breakthrough to finally carry water from one place to another that fast and easy. Can you imagine their faces if they’d know that in 2,000 years fiber optic cables– or pipes– can carry a sound and written message to far places all over the world in a seventh of a second? You’ve chanced upon this article thanks to the internet. You clicked on the link and these words you’re reading now reflected on your end through fiber optics cables and the same fiber optics transmits billions of information all over the world from deepest subways to the farthest of rural areas. If the light waves are visible, the entire picture would like a huge spider web branching out to different corners of the globe. Here are interesting facts you might not knew but wished you did. Fiber optics carries information coded in a beam of light through a cable or ancient civilization might understand as pipes. It was originally invented in 1950s to help doctors see the insides of the human body instead of slicing it open. A decade later, a certified fiber optic technician discovered that the same technological principle can be applied to carry telephone calls close to the speed of light. Fiber optics uses light to transmit the data. In other words, there is virtually no electrical signal passing through the cables, and so it is resistant to storms and electrical problems as opposed to the traditional copper wires. Naturally, it won’t generate heat which means there’s nothing to worry about catching the cables on fire. A fiber-optic cable is comprised of incredibly thin strands of glass or plastic known as optical fibers. One cable could have only one strand known as single-mode fiber or one cable with as many as several hundreds. Each of these strands is less than a tenth the width of a human hair but can carry approximately 25,000 telephone calls. You can only imagine the several million calls a single fiber-optic cable can easily carry. To paint a simple picture, that’s 10 million times the speed of DSL connections. Well, almost the same as the speed of light which is normally around 186,000 miles or 300,000 km per second in a vacuum. In theory, nothing is as fast as the speed of light; though it is important to note that this speed in a fiber optic cable slows to about two thirds. Still it is astonishingly fast. Commercial establishments use around 18 gigabytes per second the most. 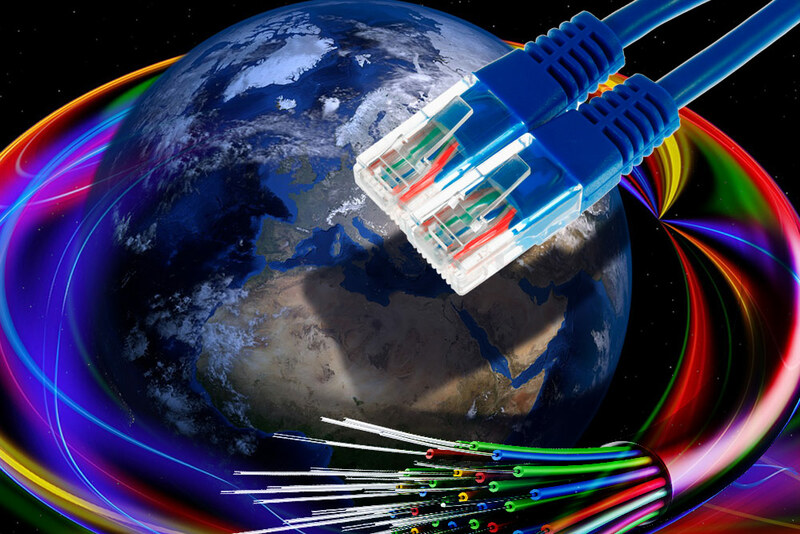 The world-breaking speed ever recorded on a single fiber line, however, is a whopping 43 Terabytes. Seriously, we’re looking at terabytes per second here. Well, not that we can really see the speed inside the cable, but we can definitely sense it every time we stream movies online or listen to music without buffering. Fiber optic cables can be considered as green technology. Is there even such thing? Yes, definitely, because of its reduced energy consumption. The amount of energy needed to shoot light to one location is far less than what is needed to send electrical signals. This could only mean that if there’s less power, then that’s less carbon out, which by extension, means lower emission and so consequently, lower prices. Fiber optics is made of silicon dioxide; silica and oxygen, two of the most abundant elements on earth. It is naturally found on water, plants, and animals. The earth’s crust is silica which is made up of rocks. The beach has silicon dioxide in the form of sands. This goes to show that fiber optics is sustainable. Though the principle behind the installation of fiber optic cables is not really new, the applications in which it is being called for and what more it could contribute to other fields or industries, are the most exciting to anticipate. It was even noted that the only missing piece in the whole run of the Internet of Things is for experts to find the right application of fiber optics to finally get our appliances talk.